Absence from school is seldom a problem, but we do need to hear from you if your child is absent. Parents are asked to ring the school prior to 8:55 am (phone 3251-004 or text 027-529 4440 or e-mail the office office@littleriver.school.nz) stating the name of the child absent and the reason. Staff will record all names received and will write these and/or any other information received in a book left on the office counter. A member of the staff may contact a parent to verify a child’s whereabouts if the school has not been contacted. Please remember that a shopping trip or a haircut, for example, is recorded as an unjustified absence. The school door is always open to parents/caregivers and while we like to know in advance that you are coming, this should not deter you from at least ringing up, or coming for a visit. While the staff will endeavour to make themselves available, you will appreciate that there are difficulties during school hours. We do like to see you – please make contact if you are concerned, or happy, about something. You can make an appointment to see the Principal or staff member by ringing the school office. • consistent firm, fair consequences for inappropriate behaviour. The Board of Trustees meet on approximately the third Monday of each month at 7.00 pm in the Staffroom. Members of the public who wish to attend may do so. Should you like to have speaking rights at a Board meeting, notice must be given to the principal or secretary at least a week prior to the next BOT meeting. Minutes of the Board meetings are held in the school office and current minutes are placed on the noticeboard in the admin area for people to read. Scholastic Book Club provides interesting reading material for the children at relatively cheap rates. Please note that it is not compulsory for any child to buy this material in spite of the fact that we act as a distribution point. However, anything that encourages children to read recreationally is useful. Please watch for the monthly notice to children when it comes home. Any purchases made require cash or a cheque to be accompanied with the order, or alternatively done on-line. Cheques to be made out to LRS as we send one school cheque with our order. Under no circumstances will bullying be tolerated at this school. We have strict guidelines to ensure the emotional safety of all children at Little River School. At the same time, through implementing a values programme, we encourage children to show and act with respect and learn mature strategies to deal with difficult social situations. Other ineligible children living on the bus route may be permitted transport if room is available and special circumstances apply. With approximately 60% of our children arriving by bus, much of our planning must revolve around the arrival and departure of these. Misbehaviour while on the bus may result in the removal of the bus privilege. Children are expected to remain seated while on the bus, and not do anything that could distract the driver and so endanger safety. All children receive periodic instruction in boarding and alighting from buses and are expected to obey these common sense rules. A set of Bus Rules is operative and children are reminded of these regularly. On leaving the bus, children must step back two paces and wait on the side of the road until the bus has moved off. When they have a clear view of the road they may cross. Children who travel to school by bus must not return by other means without first providing a note of permission from parents. Reliable information of an intention not to use the afternoon service is most important to the Bus Controller (Principal). If there are any inquiries about the bus run, please ring the Principal who will be able to help you. A school camp is held each year for children in Kahikatea (Year 7/8, 2018) and Totara. Parents are very welcome to come on these camps to help out (we require a certain number of parent helps). Notices will be sent home with all the information, e.g. food donations, clothes list, well in advance of camp. Periodically, classes in the school are involved in educational visits. It is our policy to involve parents as much as possible in these class trips, both in a supervisory role and also, so that they may share with us some of the pleasures associated with giving children the opportunity to learn outside the classroom. There is a transport charge for children going on class trips, which is added to the child’s term account. For parents taking a car with extra children they will be credited against these trips on their term account, and for those taking just their own children, there will be no charge. Please note: it is important that when a RED transport notice comes home with your child, that you fill this out and return it to school ASAP. We make every endeavour to ensure that places visited are within the scope of the children’s understanding and relevant to the subject being studied. We also like to make certain that supervision is adequate at all times. We try to gain every financial concession we can, so that the cost per child is minimised. The school has a comprehensive procedure for handling complaints. In keeping with the school’s desire to build an open partnership with parents and students, all discussion, questions, concerns or complaints should be addressed to the staff member concerned in the first instance. Where these concerns are more serious or unresolved they should be directed to the principal. If a satisfactory resolution can still not be found, the matter should be addressed in writing to the Chairman of the Board of Trustees. The school aims to provide a good balance of activities for the children. Usually, a different cultural group each term is invited to perform at the school, with all children having the opportunity to attend. If at any stage there are any changes to the custodial arrangements for your child(ren) to those given at enrolment time, please notify the office. Helmets must be worn at all times and a high vis vest. Children are to walk their cycles down the driveway. Children under 10 must be accompanied by an adult. Any matter you wish to discuss in relation to the treatment your child is receiving should be mentioned directly to the school Dental Nurse (Liz Haylock) or contact the Lincoln Community Dental Clinic 0800-846 983. We expect to see our dental nurse around May 2019. We practice safety drills regularly and follow the Ministry of Educations advice when managing this type of emergency. We practice: Drop, Cover and Hold On, drills for quakes during school time, inside. When outside we practice the ‘Turtle’ drop, make a ball and cover your head. Our children and staff have had experience and have developed confidence with coping during and after recent Canterbury Earthquakes of September 2010 and February 2011. 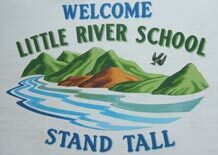 Little River School and area is on unique sub structure from Christchurch and has to date, not received the same level of damage as Christchurch. We’re also fortunate that many of our homes have water supplies and septic systems that have not been affected by earthquakes. Once an enrolment form is filled out and signed by the parent/caregiver, the child’s details are entered onto ENROL on the web, a central register set up by the Ministry of Education. ENROL is a mandatory system for all schools that is only accessible by authorised users to update as students enrol, change schools or leave the school system. This replaces the old blue and white manual record card. Parents/Caregivers of new entrants are requested to produce a copy of the Immunisation Certificate, if immunised (found in the Well Child-Tamariki Oral Health Book) and their child’s Birth Certificate or Passport (to be kept with the child’s files). This is a Ministry of Education requirement. To enable the school to take the best care possible of the children who have special medication, or medical concerns, confidential details are requested upon enrolment. Please contact the office should this change. We would appreciate notification from parents of any changes in the children’s health that occur during the year requiring special medication or care. We do request parents/caregivers to fill in a medical advice form for each child at the beginning of each year, in order to keep our records as accurate as possible. From time to time accidents do occur in spite of careful supervision by the staff members. Most of these can be readily taken care of. Most permanent teaching staff and the principal and secretary have a current First Aid certificate. In the case of a more serious accident, immediate First Aid treatment will be given and the parents will be contacted. Should the parents not be available, the school will contact the emergency number on the child’s card. To enable us to do this, please keep us up to date with phone numbers and contact details. The regularity of homework will depend on individual class programmes. Homework can take any time from a few minutes up to (but no more than) 45 minutes. Children should have the opportunity to do homework in which they are interested and see point and purpose. It may be to read and/or investigate a topic of interest, to consolidate work already introduced at school, to practice skills already learned at school e.g. basic facts, spelling, or to prepare the way for further work at school. It should be capable of being quickly checked by the teachers. This must not be worn at school. Plain stud earrings are acceptable – no ring type earrings are allowed. Classes have specific times during the week when they visit the library with their teacher. Parents are asked to help by ensuring that children return books regularly and that they are encouraged to respect the books that they borrow. Following discussions about trying to replace expensive library books that go ‘missing’, at a BOT Meeting, the Board of Trustees moved that all new enrolments from that date would be asked to pay a $20 book bond. All lost/damaged books will still be invoiced to the family concerned so we can replace the missing book(s). The book bond will at least help in recovering expenses should a child leave and not return a book. Upon leaving school and providing that the child hasn’t lost/damaged any library books, this $20 will be refunded. • visiting the school regularly to search the lost property box and at the end of each term when they are put out on display. Pupils are required to remain seated for the first 15 minutes of the lunch hour to eat their lunch. In the interests of safety we ask that the children bring their drinks in plastic bottles. Children are not permitted to leave the school grounds at lunch time. However if the child is to return home for lunch break, they will need a short note from their parent/caregiver to verify this. A newsletter is published and emailed out each Friday to keep you informed of school events. A “red” notice coming home means that a reply is needed from parents/caregivers, this is usually a transport form for an upcoming event. A newsletter is published once a month, which is distributed to the wider community, and we are always appreciative of a donation from the community towards the cost of printing this. The School is committed to providing all the children access to Information Technology by way of computers. A Technology programme has been developed which all children will participate in here at school. Year 7/8 children go over to Akaroa Technology Centre once a week on a Thursday for Manual Training. In order to make teaching most effective, some children will return to other classes for Mathematics and Reading Instruction. A teacher aide is employed to carry out tasks in Reading and Language, to assist with the classroom programme. A Teacher Aide is employed part-time in the classrooms to assist children requiring further tuition in areas such as reading. Any voluntary offers to listen to reading is also greatly appreciated. The School Organisation is designed to give children entering school in the junior years the best start. There is usually a parent assembly held once a term. Parents are encouraged to come along and support their children to celebrate their successes. Assembly will be held at approximately 2.00 pm on those days. We ask that preschoolers be kept as quiet as possible so all parents attending can hear the school children speak. We invite new entrants and their parents/caregivers to make four visits to our Junior Room during the month prior to starting school. The initial visit could be for either a morning or afternoon session with subsequent visits lengthening to include lunchtime. These visits enable children to become acquainted with some of the classroom and school routines. They also allow parents/caregivers to see some of the activities taking place in the junior classroom. Children are not expected to bring anything with them on these visits except morning tea and / or lunch. We are unable to enrol children before their 5th birthday. Spend quality time with your child… talking, listening, playing and sharing experiences are some of the most important things you can do. Even the most routine chore can be turned into a learning experience, e.g. a) Shopping – Can you find the…? b) Washing – Can you sort out the clothes into colours? Let them dress themselves and make choices. Let them play with their peers so they can learn how to share and co-operate. Give them responsibility in the way of small jobs around home. Let your child play and make things, even if they do get dirty and make a mess! Encourage them to experiment with sand and water. Read to them as often as possible and encourage them to make up their own stories. Share poems, rhymes and songs. use a variety of different writing tools, e.g. pencils, pens, crayons, magnetic letters. Remember – your child may be able to do all, or only some of the above. A child who comes to school with a wide variety of experiences has a great foundation for continuing life-long learning. As part of our Behaviour Management Plan, we like to reward children who are meeting expectations. Privilege takes the form of 40-60 minutes of recreational or craft activities on a Friday after assembly, taken by teachers and parent helpers, when available. We are always on the look out for volunteers. For a small number of girls who may reach this stage of their development, information and assistance, if necessary, is available from our Public Health Nurse. Daily reading is important for your child. The juniors have a reading folder that moves between home and school every day. This is held every alternate Friday from 9.00 – 9.30 am. This programme is organised on an Interdenominational basis. Children are taught aspects of Bible according to their age level. If you do not wish your child to take part in this programme, please contact the Principal and record your wishes on the enrolment form. A Report goes out in the first term of the school year, followed by parent/teacher interviews early in Term 2. A another written report is done in the third term (September). However, at any stage, if you have any concern about your child’s progress, or about any aspect of the school’s activities, please phone us to make an appointment to discuss it. This is to encourage leadership. The school promotes a system of school leaders (from Year 8), as well as a representative from each of the classes, who make up the School Council. They meet with the Principal on a regular basis to discuss school issues and they also organise certain events, e.g. a school disco. Little River School stages a Musical/Drama Production every second year. This is a big undertaking which involves all the children, teaching staff and many parents. The benefits of this exercise are numerous ranging from the development of musical and drama skills, to the extremely important development of children’s self-esteem. We stage our production in August or September of the particular year, in the Little River Community Centre and it usually runs for two nights. 2002 The Greatest Little Kiwiana Show Ever! Cyclists should walk in with their cycles to the bike stand. No children leave the school grounds without proper authority. Major ball games should be played on the field and no balls strayed over the school fences are to be retrieved without the permission of the teacher on duty. Special care is encouraged in the Adventure Playgrounds. Safe usage is the prime requirement. The Domain is out of bounds. Consideration for others is of prime importance. The Support Group, made up of voluntary parents who meet approximately every 6 weeks, work with teachers, trustees and children to provide support and funding for extra equipment etc. If you are interested in coming along to support these meetings, please contact Charlotte Manson, Chair, or the school office. These meetings are advertised in our newsletters. The School donation helps to cover special “extra” activities that enrich the school year. All fees are acknowledged as a donation to the school and a receipt is issued. Often transport charges and trips/activities charges are also added to the term account where necessary. In order to spread costs throughout the school year, payment of the donation is usually asked for at the end of each term as a part of the term account. Royal Blue coloured polo shirts with LRS logo – Sourced via school from our supplier. We encourage all children to at least have one of these. They are also worn at sporting events. Black bottom half – skirt, skort, shorts, trousers, tights. These can be sourced via school also, but parents are free to purchase where they wish. The school will deem to make orders twice a year in approximately March and September, to coincide with the new seasons. A payment needs to accompany your order (cheques to be made out to LRS). We use a local supplier, Olly’s, for the Polar Fleece and parents can source the black bottoms from the supplier of their choice. We have a smoke-free school environment. This includes all school areas, plus all school based events and activities. The role of the school is to ensure that opportunities are provided for children regardless of their abilities, to participate in sport. Children are encouraged to learn the basic physical skills of throwing, catching, hitting, running, jumping, kicking and climbing. They can use these skills in sports, minor games, small group activities, and modified and mini games. The children can also participate in other challenging activities. This is mainly done on a school basis although we do combine with the other schools in our district for swimming, cross-country, athletics and a variety of tournaments. We have a lot of parent participation to help us with this programme. PE is an important part of the curriculum. If for some physical reason your child cannot take part on a daily basis, a note from home is required. A stationery list for each class up on our website will show what is needed for the new school year, which gives parents an opportunity to purchase these in town while the ‘back to school’ specials are on over the Christmas holiday break. Alternatively, you may puchase ‘pre-packed’ through the Paper Tree, Tower Junction. Children must wear a navy school hat outside or stay in shaded areas during Terms 1 and 4. The named hats are kindly provided by our Support Group and must stay at school. Any lost hats will cost $10.00 for a replacement. This is a vital school subject and must be treated as such. The requirement is simple. The children MUST bring their togs unless excused with a letter in writing from a parent/caregiver. It is part of our job to encourage confidence and a love of swimming, as well as to teach skills. We cannot do this without the absolute co-operation of parents in guiding their children to bring their togs each day of the swimming season. If the weather becomes too cold for swimming, then the children will miss that session, but we would like to be able to make that decision at swimming time and not at the beginning of the day. If needing to take your child from school during the day, please ensure that the child’s teacher or one of the staff members is informed, especially if it is during a break. This is particularly important as if nobody has seen the child depart, it may take some time to establish his or her whereabouts. Please ensure a note of the arrangements is made in the day book, kept on the counter of the school office. This can be done via a phone call. You must sign your child out, if they need to leave early. Many of our children ride bicycles or walk to school and are obliged to travel on or cross busy roads. The risks involved are obvious to most and we know that you support us in our programme of road safety education. We request parents dropping off or picking up children to park well clear of the gates. It is the Land Transport Safety Authority’s recommendation that children under the age of 10 years need supervision when riding on public roads, and those any younger generally do not have the ability to judge traffic behaviour. We endorse this recommendation. Anyone on a bike must wear a helmet, which is the correct size, well fitted and maintained. Anything you share will remain confidential. Sharing helps the school provide understanding and support for your child. © 2019 Little River School. Website by SimplyWebsites.